Age-related Macular degeneration is one of the leading causes of vision loss. It is a serious condition which causes the deterioration of the central area of the eye called the macula. The macula is responsible for giving us a focused vision. But in AMD this ability to focus is lost. The eye cannot distinguish faces, gives trouble while driving or watching television or even reading. This results in low vision which is also a form of blindness. The macula is made up of light-sensing cells that are placed very close to the retina, located at the back of the eye. It lets us see the objects straight ahead of us. It is the most sensitive part of the eye and when the macula is damaged, the center of your vision will become blurry, dark and distorted. 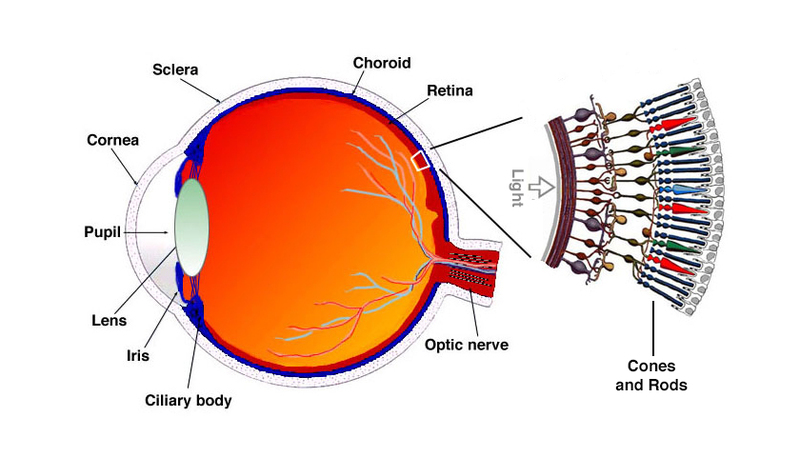 The retina contains two types of photoreceptors namely, rods and cones. Rods are responsible for vision during low light or night vision. They are numerous, around 120 million and are very sensitive. However, they are not sensitive to color. Cones work at higher light levels and are also capable of color vision. Cones give us the sharp details. The mesopic is the area or the light levels where both rods and cones are operational. How does Macular Degeneration happen? AMD is very common eye condition that affects people of 50 years and older. For some people, AMD advances so slowly that vision loss does not occur for a long time. While in some people it happens very fast. The most common symptom of AMD is a blurred area in the center of the vision. Over time, this blurred area grows and there appears to be a blank spot. Even the objects start to appear less bright. There are two basic types of AMD: Wet and dry. Dry degeneration is 80 percent more common than wet degeneration. Dry Macular Degeneration or non-neovascular results from aging and thinning of macular tissues. Yellowish spots begin to accumulate in and around the macula. Vision loss occurs slowly and gradually. Wet macular degeneration happens mostly when dry macular degeneration progresses to an advanced stage. Here new blood vessels grow beneath the retina and leak blood and fluids. This causes permanent damage and results in blind spots in central visions. Early AMD where most people do not experience any vision loss yet. But regular eye checkups are required. Intermediate AMD where there may be some vision loss but very slight or hardly noticeable. A comprehensive eye exam with special tests for the retina is required. Late AMD where vision loss becomes noticeable. What are the major causes of AMD? If you smoke, do not exercise, your blood pressures and cholesterol levels are not normal and if you eat a very rich or fast food diet. Also, people with a family history of AMD are prone to the disease. Age: For those over 60, the rate of AMD is 1 in 8 and for those over 80 it is 1 in 3. Obesity and Inactivity: Those who perform some form of exercise or regular walk and yoga have fewer chances of developing AMD than those who are inactive and have a higher weight. Heredity: Specific variants of genes are present in people who develop AMD at a later stage. Hypertension or high blood pressure is directly related to the eye pressure and results in macular degeneration. Light eye color: Some researchers have found that dark eyes act as an extra protective layer against degeneration. The finding is contradictory but cannot be ignored. High exposure to blue light for more than 2-4 hours daily before the age of 30 years. Some steps can be taken in order to prevent or delay AMD. Change in diet: Have plenty of omega 3 fatty acid rich foods especially fatty fish. Stop using vegetable oil as they take away the benefits of omega 3 fatty acids. Olive oil, coconut oil, avocado oil, butter, and ghee are fine. Taking food and supplements containing lutein and zeaxanthin increase the density of pigments in the macula.Dark green Leafy vegetables like spinach and kale, egg yolks, nuts are rich in lutein. But take them only after consulting your eye care professional. Also go low on high glycemic index food or processed, junk foods, refined carbohydrates, and sugar. Regular exercise, yoga, exercises for the eyes and proper rest can delay AMD. Also, protect your eyes from the harmful ultraviolet light by wearing sunglasses.